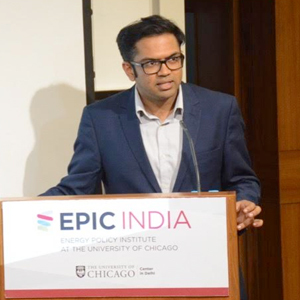 Santosh Harish is Associate Director- Research at Energy Policy Institute at U.Chicago- India. He has a PhD in Engineering and Public Policy from Carnegie Mellon University, and received his BTech in Materials Science from IIT Madras. Santosh’s research interests lie in energy and environment policy, with ongoing work in electricity supply reliability, air pollution, irrigation pump-sets and energy efficiency.